Today in Masonic History Cadwallader, 9th Lord of Blayney passes away in 1775. Cadwallader, 9th Lord of Blayney was an Irish peer. Cadwallader was born on May 2nd, 1720. During the Seven Years War, Cadwallader served in the 91st Foot, a unit of the British Army. He served in the unit until 1763 when the unit was disbanded. During his time in the 91st Foot he succeeded to the title of 9th Lord of Blayney. In 1766, Blayney served in the 38th Foot. He served as a colonel until 1775. Cadwallader served as Custos Rotulorum of County Monaghan. The position is the highest civil officer in a county. They are responsible for the records of the county. The position still exists today, it is largely now a ceremonial position. Cadwallader passed away on November 13th, 1775. 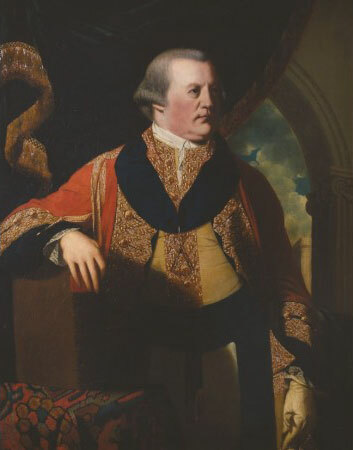 Cadwallader was the Grand Master for the Grand Lodge of England (Moderns) from 1764 to 1767. During that time the Charter of Compact was drawn up which converted a local Royal Arch Chapter to the Excellent Grand and Royal Arch Chapter, making it the controlling body for Royal Arch Masonry in England. Cadwallader signed the Charter, it is believed, in 1766. The original Charter has been examined by many experts and in the 1940's it appears to have been confirmed that the Charter was altered after the fact. One theory as to why this was done is that in 1766, Cadwallader was still the sitting Grand Master for the Moderns who did not recognize Royal Arch Masons. Because of this it is believed that the Charter was altered to a date after 1767 when Cadwallader stepped down from the office of Grand Master. In 1768 Cadwallader was the Grand Master of the Grand Lodge of Ireland.